We’ve kept our eye on this amazing new development located at Legacy Drive. Here’s what you can expect from the grand opening happening this weekend. There’s a lot of action bubbling at Legacy West, North Texas’ largest and newest mixed-use destination that’s about to open several new shops, restaurants, and entertainment venues. Want to see it for yourself? Stop by the grand opening weekend celebration, happening Friday, June 2 to Sunday, June 4, and make sure you don’t miss these must-see events. Jordan Kahn Music Company will kick off the weekend festivities with a Friday night concert starting at 7:30 p.m., followed by a performance by the Emerald City Band on Saturday (June 3) at 2 p.m. and Party on the Moon Band at 7:30 p.m. Taylor Pace Band will close out the weekend on Sunday (June 4) at 2 p.m. All of the performances are free and will be held at the Main Stage near True Food Kitchen. 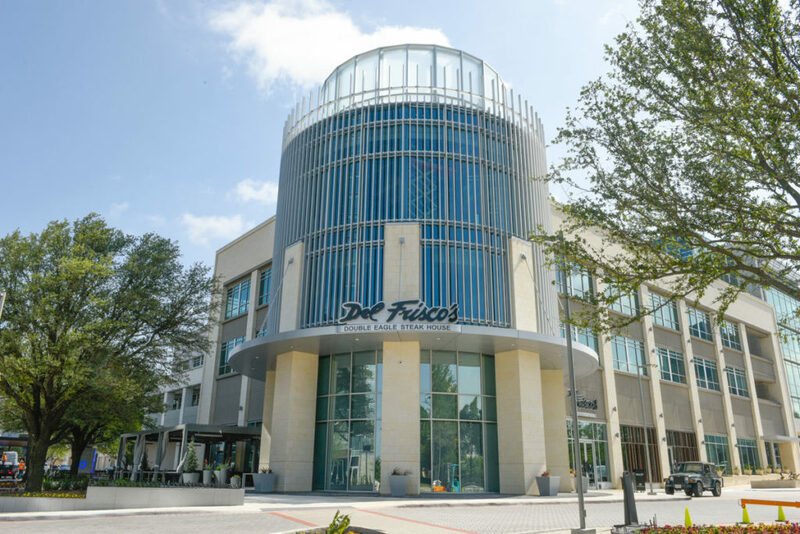 To mark the grand opening occasion, many of Legacy West’s newest retailers are offering shopping exclusives for eager opening weekenders to score. Perks range from giveaways (Johnny Was, Levis, Peter Millar, Pockets Menswear, Renaissance Hotel, TUMI) and 20% off discounts (Bonobos, Fabletics, Johnny Was) to in-store beverages and snacks (Coach, Fabletics, Johnny Was, Peter Millar, Pockets Menswear, Suitsupply). Enjoy more bespoke experiences like a lesson from TUMI’s luggage-packing experts. Be sure to pick up a complimentary swag bag at the Venetian Nail Spa before you sip a glass of champagne on the new patio of the Renaissance Hotel. If you’ve worked up an appetite checking out all of those shopping exclusives, don’t fret: Legacy West’s roster of impressive restaurants and eateries have plenty of bites lined up. Del Frisco’s Double Eagle Steak House will be sampling its bar appetizers, or you can taste special menu items and cocktails from new restaurants like Earls Kitchen + Bar, Fogo de Chao, Haywire, North Italia, Starbucks Reserve, and Sprinkles (you’ve got to try the Legacy West Chocolate Caramel cupcake, a weekend exclusive). Pick up some complimentary crinkle fries at Shake Shack to commemorate the occasion, and be sure to stop by Legacy Hall to check out the many stall operators’ takes on foods like donuts, ice cream sandwiches, and waffles—plus beer tastings. Also don’t miss Mesero’s patio party, because there will be margaritas. Or, if you’re in the mood for a more exclusive cocktail, True Food Kitchen’s Plano Paloma cocktail is only available June 2 through June 4. 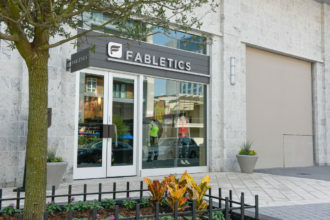 Join Fabletics’ Pat Fabulous for a complimentary group yoga class by the Main Stage at 9 a.m. on Saturday, June 3, and get your stretch on before checking out a “sneak peek” of Legacy Hall, the new 55,000-square-foot food hall at Legacy West. 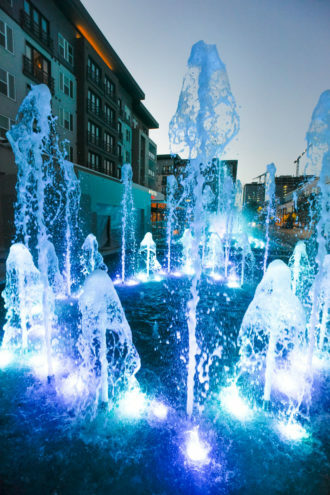 So far, we’re expecting sunshine and not much drizzle with temps in the high 80s, so be sure to pack your sunscreen, stay hydrated, and enjoy the new outdoor fountains and public spaces that flank all of Legacy West’s high-quality shopping and dining. Friday, June 2: 5 p.m. – 9:30 p.m.
Saturday, June 3: 12 p.m. – 9:30 p.m.
Sunday, June 4: 12 p.m. – 5 p.m.
For more information about Legacy West’s opening weekend festivities, visit www.legacywest.com.